Much of the discussion about the new Teenage Mutant Ninja Turtles movie (Out of the Shadows) has centered on what a welcome addition to the film Bebop and Rocksteady have been. They have always been fan-favorite characters after all. 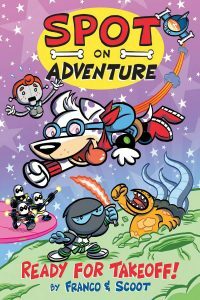 Well now, for the month of June IDW have given the boar and rhino their own comic book line — and a time machine. 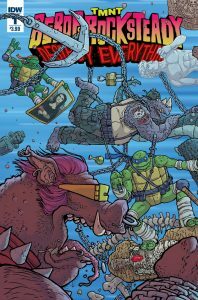 Be very, very afraid as Bebop and Rocksteady Destroy Everything in a new 5-issue full-color mini-series. According to Comics Alliance, “…the eternal misfits of the TMNT franchise find themselves bouncing around through time itself courtesy of writers Dustin Weaver and Ben Bates, with a cast of artists that includes Nick Pitarra, Sophie Campbell, Giannis Milonogiannis, and Ryan Browne. And if that wasn’t enough, they’re bringing a few old friends along for the ride, too!” In an unusual (but probably appropriate for these guys) move, IDW is releasing a new issue of the mini-series every week through June — so get yourself caught up! (Sorry: We didn’t come up with that one!) Legend is a new full-color science fiction series from Z2 Comics. 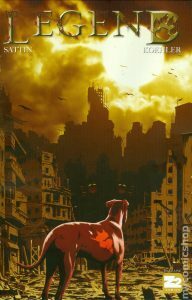 “What if a biological terror agent wiped out most of humanity, and our domesticated animals were left in charge? 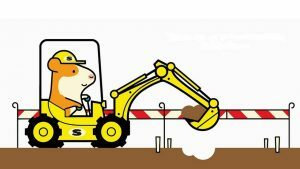 How would our dogs and cats set about ruling and rebuilding the world? Ransom, the leader of the Dog Tribe, has been murdered by a creature known as the Endark. An English Pointer named Legend reluctantly rises to lead in his place, vowing to kill the monster once and for all. From acclaimed novelist Samuel Sattin and award-winning illustrator Chris Koehler comes Legend, where cat technology rules, dogs partner with hawks, and humans may be the most beastly creatures of all. ” According to Bleeding Cool, the first run of issue #1 has already sold out and gone to a second printing. My, people like their post-apocalyptic pets, don’t they? Check out the article for a preview trailer created by Z2 as well. Some good news coming our way thanks to Cartoon Brew: After initially bowing out of directing the Hotel Transylvania movie series after the second (very successful!) film, Genndy Tartakovsky had a change of heart and will in fact return to direct Part 3. “Acknowledging the surprising turn of events, Tartakovsky said in a statement, ‘I thought I was done exploring the world of Hotel Transylvania after the first two films, but while I was away from the franchise finishing my TV show Samurai Jack, an idea sparked that I got really excited about and made it irresistible to return and helm myself this third adventure.’ Michelle Murdocca will produce the film again, and Adam Sandler will executive produce and return as the voice of Dracula. Michael McCullers (Austin Powers: The Spy Who Shagged Me, Boss Baby) is writing the screenplay, and Selena Gomez and Andy Samberg will revive their roles as Mavis and Johnny, respectively. Sony has slated the third installment of Hotel Transylvania for September 21, 2018. ” Maybe then we’ll find out more about the relationship of half-vampire Dennis and all-werewolf Winnie. (They zing’d, after all!). The article at Cartoon Brew also mentions other upcoming Sony Pictures animated projects, including The Star (formerly The Lamb — a faith-based feature that follows a young donkey who helps to bring about the very first Christmas). Future-Worm! is a new 2D animated TV series coming to Disney XD this August. 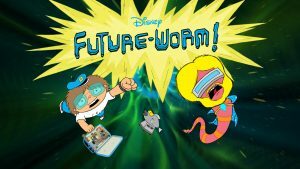 According to the Deadline: “Created and executive-produced by Emmy-winning director Ryan Quincy (South Park), Future-Worm! centers on Danny, played by Andy Milonakis, an optimistic 12-year-old who creates a time machine lunch box, and then meets and befriends a fearless worm (James Adomian) from the future (with titanium-enforced abs). The comedy follows Danny and Future Worm as they embark on adventures through space, time, and study hall. The characters were introduced last year in a popular Future-Worm! short-form series …on Disney XD’s YouTube Channel.” Which you can find right here. We got this from Animation World Network: “Genius Brands International, Inc. (GBI) announced that Netflix, the world’s leading Internet TV network, will premiere GBI’s new original preschool series, Llama Llama, to members worldwide in 2017. Currently in production on 15 half-hour episodes, Llama Llama, based on the award-winning and bestselling book series by author and illustrator Anna Dewdney, is led by an all-star team of creators, including Oscar-winning director Rob Minkoff (The Lion King), director Saul Blinkoff (Doc McStuffins, Barbie’s Dreamtopia, Winnie the Pooh), Emmy winning writer Joe Purdy(Arthur), legendary Disney art director Ruben Aquino (Frozen, The Lion King, Aladdin, Mulan) and Emmy-award winning producers Jane Startz and Andy Heyward… Llama Llama is an animated series about childhood moments and adventures, as well as the special connections between the lead character, Llama, his parents, grandparents and best friends. 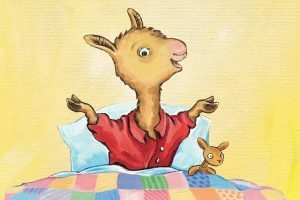 Llama Llama tells heart-warming tales of life in a safe, friendly town seen through the eyes of Llama as he interacts with the amazing world around him.” We’ll keep you informed of the exact release date. A new collection of questionable biology, courtesy of Toon Books. What else can you say about A Goofy Guide To Penguins? “How can you tell penguins apart? By the color of their mittens, of course! But do penguins really play hide-and-seek, carry pink umbrellas, and shower on the backs of whales? 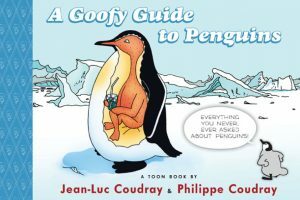 In this wild guide, twin brothers Jean-Luc Coudray and Philippe Coudray (Philippe is beloved for the bestselling Benjamin Bear series) bring us all the less-than-true truths and not-so-factual facts about the South Pole’s silliest birds.” We introduced you to Benjamin Bear previously. Now you can order this new hardcover book directly from the publisher, as well as other fine book outlets. 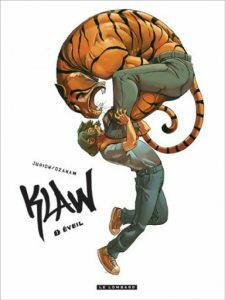 You might have heard before, but here’s a reminder about Klaw, a popular full-color comic written by Antoine Ozanam and illustrated by animation and gaming-design legend Joël Jurion. “Teenager Angel Tomassini has been hiding a dark and scary secret: when threatened he involuntarily turns into a violent and vicious were-tiger. He doesn’t know why, how, or what to do, because when he transforms, he loses control and people end up badly hurt. As if this isn’t enough for a kid to deal with, Angel is slowly learning his father is one of the biggest organized crime leaders in the city. And there are more were-animals like Angel and different creatures too. The high school changes Angel Tomassini experiences are unlike anything his peers can identify with!” Now Magnetic Press have released Klaw for the first time in North America, now as a hardcover graphic novel. Check out the preview pages and more.